With summer in full swing it is important to keep an eye on one’s plants. While maintaining a green lawn and vibrant garden is most homeowner’s primary yard concern, homeowners should strike the balance between giving their plants enough water, and avoiding wasting too much water. A good irrigation system and proper watering techniques can be key to maintaining a beautiful yard, while conserving water and maintaining lower costs. Regardless of the irrigation system itself, using the right watering techniques on one’s lawn can make a difference in both the overall health and look of the lawn and garden. The following tips can help preserve one’s yard, with less water waste, and at a lower cost. With sprinklers one should water twice a week for a half inch coating of water on the yard. Another option is to let the lawn go dormant. The yard can tolerate this for about two months, and is very quick to recover. This can be beneficial for those trying to save water and money during the summer months. Homeowners should also have the right irrigation system for their lawn. For large grass covered areas, a traditional sprinkler system normally works best. When you have large garden areas is when a drip irrigation system really shines. Having the right system is key to maintaining one’s unique outdoor space. Drip irrigation is a system that can both maintain a lush garden, while also conserving water. This system efficiently waters plants via a controlled delivery of water directly to the ground. 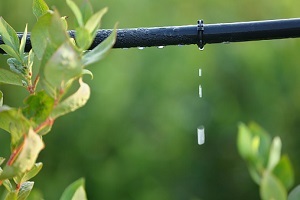 Drip irrigation is made of tubing that moves from its source to its drip emitters or micro sprinklers. The tubing is snaked within the groundcover area and landscape beds. The water drips from the tubes directly over the roots of the plants. It is this direct contact with the plants that saves water over time since water is not wasted being sprayed on insufficient areas. Drip irrigation also saves water because there is no drift. Drift is when the wind blows water onto areas that do not need to be watered, such as the driveway or sidewalk. The direct approach of drip irrigation is the key to its ability to both conserve water and target only the areas you need watered, such as letting your grass go dormant while keeping your garden watered. While a drip irrigation system has benefits for groundcover area and landscaping beds, it would not be cost efficient to have this system with a large yard. A large area will be better served by a traditional irrigation system. This type of system also requires more maintenance than traditional sprinklers. While regular maintenance might seem like a pain, it can actually be relatively easy. Some of this maintenance can be done by the homeowner themselves, and only a little bit needs to be done by a professional. Having a natural outdoor space that is sufficiently watered, but not wasteful is easy with the expertise of the licensed technicians of Greener Horizons. We’ll take the proper steps to ensure that you create the yard of your dreams, without the added costs of too much water. Learn more about about our lawn care services and contact us today for a consultation.